folliculitis decalvans Folliculitis over scalp area that turn to fibrosis in course of time The Folliculitis if treated at the beginning stage with proper homeopathy can prevent the follicles from fibrosis. Here the cure percentage is very good. But once the fibrosis developed there is minimal chance of cure by any treatment. So in the beginning stage the cure percentage is MAXIMUM, but in later stage where fibrosis has already developed the cure percentage is MINIMAL. Tufted folliculitis This can occur after scarring alopecia of any cause. Fibrosis of the follicles can cause tortional changes so that more than one hair can grow from the follicle Tufted hair folliculitis is a progressive pattern of scarring alopecia. Its characteristic feature is the presence of groups of 10-15 hairs emerging from a single follicular opening. The cause of this disorder is unknown. It is probable that tufted hair folliculitis represents an advanced stage of follicular injury seen in several types of scarring alopecia. Here the homeopathy treatment may help if treated with constitutional way of homeopathy treatment. 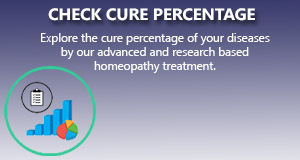 The cure rate depends from person to person So here the percentage of cure can be MODERATE. Follicular lichen planus Lichen planus of the scalp Here the cause of hair loss is lichen planus over scalp. It is thought to be due to an abnormal immune reaction. Follicular lichen planus, also known as lichen planopilaris, results in tiny red spiny papules around a cluster of hairs. Homeopathy has immune modulatory effect. So any disorder arising from abnormal immune reaction can be well treated with proper homeopathy medicines and thus in lichen planus homeopathy has a very good cure percentage. So here the percentage of cure rate is MAXIMUM. Physical or mental stress can cause temporary hair loss. The reason for this is that the hair follicles enter the telogen phase prematurely, this causes them to stop growing new hairs and to shed hairs. Some disorders of the skin, for example psoriasis, tinea infection, lichen planus on scalp may cause hair loss. Since hormones both stimulate hair growth and cause hair loss, hormonal changes by far have the biggest impact on hair loss. These can affect both men and women. Men generally have hair loss concentrated in a specific pattern from the front through to the crown. Women tend to have thinning throughout their head without being in any specific pattern. This type of hair loss is caused by the androgen DHT, or Dihydrotestosterone. Since everyone has DHT that is produced by their bodies and only some people suffer from hair loss there has to be another factor involved. This other factor is having follicles that have a greater number of Androgen receptors for the DHT to attach to. This is the component that is inherited through the genes. After pregnancy many women experience a loss of hair, this is caused many hair simultaneously entering the resting (telogen) phase. This condition is caused by the hormonal changes that take place after a woman's body recovers from her pregnancy. Hair loss increases likelihood increases with age. By 35, 40% of men have noticeable hair loss, while by 60 65% do. Also elderly hair tends to be more thin and fine giving more of an appearance of hair loss. After the menopause thinning of the hair is more pronounced, by the age of 50 more than 50% of women have thinning hair. If iron in the body is low then this may cause hair loss also, this is generally more a problem with women. Some people who go on low protein diets, or have severely abnormal eating habits, may develop protein malnutrition. To help save protein the body shifts growing hair into the resting phase. If this happens massive amounts of hair shedding can occur two to three months later. A sign of this is if the hair can be pulled out by the roots fairly easily. Women who have a genetic predisposition to suffer from Androgenic Alopecia can have it occur at a much younger age by taking birth control pills. The hormonal changes that occur trigger the onset of the Androgenic Alopecia. Some children and less often adults play with their hair by pulling on it or twisting it. This can be part of a behavioral problem. If the behavior is not stopped permanent hair loss can result from the constant stress on the hair. Many people change the appearance of their hair by using chemical treatments like dyes, tints, bleaches, straighteners, relaxers and permanent waves. Hair can become weak and break if any of these chemicals are used too often. Hair can also break if thesolution is left on too lon. Treatment of alopecia or hair loss is directly related to its cause. A healthy hair follicle can produce a healthy hair. So in regards to treatment of hair loss or alopecia the treatment which treats the causative ailments can give a long standing and established result. A proper homeopathy treatment can be proved most beneficial for the treatment of any type of hair loss as homeopathy treats the root cause of any health disorders. Hair loss due to any mental and physical stress can be well treated by proper homeopathy treatment as homeopathy medicines gives good impact on psychological and spiritual level thus helps to maintain a healthy mental condition and indirectly regulate to maintain a healthy balance of stress hormones in our body. Over secretion of stress hormones can put bad impact over the hair follicles. Dr.Rangadhar Satapathy.MD(Hom) is a well experienced globally recognized homeopathic physician treating patients from more than 65 countries and has an excellent track record of cure rate more than 92 % in different diseases. Many critical non curable cases has been successfully cured by his modern, scientific, and advanced approach of homeopathy treatment. He has proved in his treatment that homeopathy works and gives better result in many diseases both in acute and chronic cases than the usual conventional treatment. send me best medicine names that help full for heredity hair loss that i will buy from local homeo phatic store.. I have hair fall problem and this is so serious problem for me . i want best dr. For hair problem . My hair too falling and has became like baldness kindly advice me about good treatment . What is the best treatment for hair regrow on baldness with no side effect?